Five years ago, the Enough Project along with select jewelers, NGOs, gold industry representatives, and U.S. government officials founded a working group with the aim of boosting the conflict-free gold trade from eastern Congo. The dream of the group, which became the Responsible Artisanal Golds Solutions Forum (RAGS), was to build a market for conflict-free gold from Congo and bring it to U.S. jewelry stores — i.e., to build up the demand for gold mined by Congolese artisanal miners who worked in mines where the profits benefited the mining communities, not armed groups or the Congolese army. Part of that dream is now becoming a reality. Over the past three years, RAGS has been hard at work trying to create this end-to-end supply chain, and in October the forum announced that gold mined at a certified conflict-free artisanal mine in South Kivu, eastern Congo is now being sold in the United States as jewelry by Signet Jewelers. The project was an important proof of concept – demonstrating that it’s actually possible to get conflict-free artisanal gold from Congo all the way to U.S. jewelry stores through the world’s largest gold refiners certified by the London Bullion Market Association (LBMA). Achieving this goal has not been easy. Banks, refiners, and others in the gold supply chain have found it very high-risk to import gold from eastern Congo, and it was very hard to find an exporter in Congo that was not named in a U.N. Group of Experts report for involvement in conflict gold smuggling. But thanks to a lot of work to educate those industry players, strong commitments from Asahi Refinery, Signet Jewelers, Richline jewelry manufacturers, USAID’s Responsible Minerals Trade team, TetraTech, the LBMA, the Better Sourcing Program, Fair Congo, and Resolve, the conflict-free artisanal gold supply chain originating in Congo and ending in the United States was finally shown to be possible. This project follows in the footsteps of the first export of conflict-free artisanal gold from Congo that Canadian NGO IMPACT organized in partnership with Fair Trade Jewellery Company (FTJCo) in 2017. That was an important milestone, and IMPACT continues to run projects at artisanal gold mines in eastern Congo through its Just Gold program to help make them conflict-free and legal and to boost the livelihoods of artisanal mining communities. The RAGS project was a bit different in that it represents a very large potential market for conflict-free, responsible artisanal gold from Congo. Signet is America’s largest jewelry retailer, owning Kay, Jared, and Zales jewelry stores, Richline is a large jewelry manufacturer, owned by Warren Buffett’s Berkshire Hathaway, and Asahi is one of the world’s top refineries, certified by the LBMA in London. In other words, if much more conflict-free gold became available from Congo, these companies could fully absorb the demand for it. It’s also important to recognize the bigger picture. There are still major obstacles to building up the conflict-free gold trade in Congo. According to the United Nations, gold provides the largest source of revenue to armed actors in the conflict in eastern Congo, and $300 to $600 million is smuggled out of Congo annually. An estimated 96 percent of artisanal gold mines in Congo are not certified as conflict-free at present (60 out of approximately 1,499). Additionally, an estimated 71 percent of gold miners worked at conflict mines in 2015-16, according to the International Peace Information Service (IPIS), and in 2017 the U.N. Group of Experts said that it had confirmed that nearly all artisanally sourced gold in Congo was exported illegally. 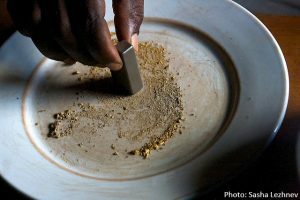 A recent report by The Sentry raised serious concerns that gold mined from conflict areas in eastern Congo is reaching international markets, including the supply chains of major U.S. companies and in products that consumers use every day. To resolve those issues, the United States, European Union, U.N. Security Council, and gold industry companies should take action in three main areas. First, there must be consequences for the corporate networks that purchase conflict gold, such as sanctions and anti-money laundering measures. Second, the tax issues that help perpetuate the illegal smuggling of gold from Congo to Uganda and Rwanda need to be resolved. In particular, the United States, companies, the International Conference on the Great Lakes Region (ICGLR), and others should work with the provincial governments in eastern Congo to lower Congo’s record-high tax rates for legal gold trade down from their astronomically high rates of up to 13 percent – compared with a zero percent rate in Uganda. They should also work to equalize gold export tax rates between Congo, Uganda, and Rwanda. The Enough Project report “Breaking the Cycle” highlights these issues in detail. Third, Congo’s Mining Ministry should approve many more artisanal mining zones (ZEAs in French), and should grant mining titles to artisanal mining cooperatives. Legalizing and formalizing artisanal mining are keys to developing the sector and allowing resource revenues to stay in Congolese communities. Consumers can play a role to help end the conflict gold trade and promote a responsible gold trade. Visit this site and this site to learn more.